Banana Shire, an area of 28,577 sq km, is generally 130 km south-west of Gladstone. It includes the Callide and Dawson Valleys and their associated coalfields, together with about two-thirds of the former Taroom Shire which was added to it in 2008. 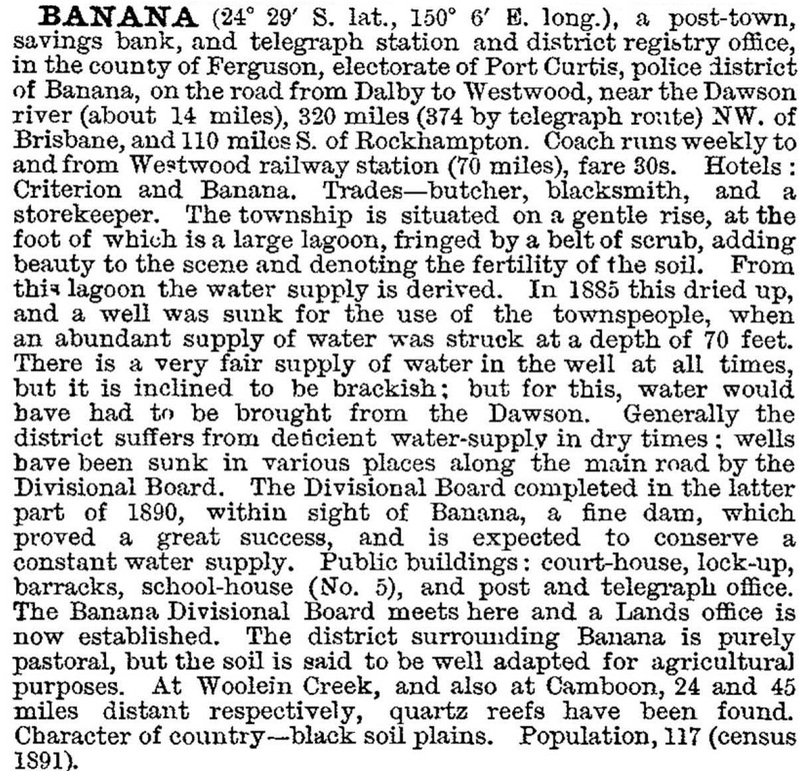 Pastoral occupation began in the 1850s, various runs including the Banana pastoral holding (1855). The holding was under Leith Hays who a couple of years before had the nearby Rannes holding. Hays used an old dun-coloured bullock named 'Banana' at Rannes to decoy wild cattle into a holding area. The shire hall, a simple gabled structure (1906) was physically moved when the headquarters were transferred to Rannes where it remained until 1944. By then there had been extraordinary agricultural development in the shire. Pastoral leaseholds were resumed for closer-settlement in the Dawson Valley in the 1920s (see entries for Moura and Theodore) and in the Callide Valley (see Biloela entry). Gold mining began in the Depression years at Cracow in the south of the shire. Coal mining started during World War I at Baralaba (see entry), and larger scale mining started at Moura in the 1960s and at Callide in the 1970s. Water harvesting on the Dawson and Callide River systems furthered dry land cotton growing and brought in large scale sorghum and wheat production. Prickly pear eradication in the 1930s uncovered land suited for grain growing and beef cattle grazing. Brigalow clearing in the 1950s-60s produced more grazing land. There were an estimated 80,000 dairy cattle in the 1950s on over 700 farms in the Dawson and Callide Valleys. 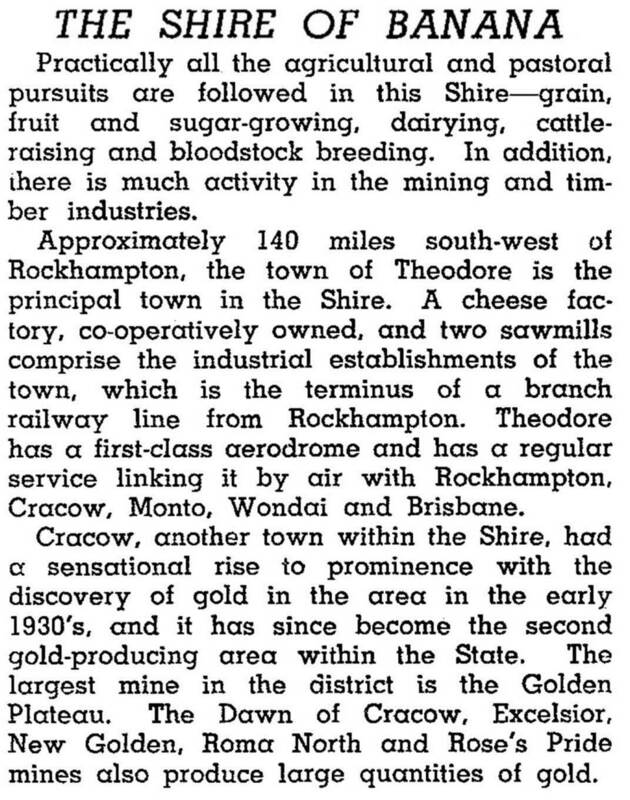 Biloela and Wowan had dairy factories (1936-75, 1919-69) and Theodore had a cheese factory (1942-52). In 1993 there were 400,000 meat cattle in the shire and 33,000 pigs. Cereal growing took up 52,000 ha and there was substantial fodder production. A network of lines was opened from Gladstone to Theodore and Biloela after 1920 and more lines were built in the 1960s for transporting coal. The Callide dam was completed in 1965, coinciding with the opening of the Callide A coal-fired power station. The dam was enlarged in 1988 for the Callide B power station and has a 40 km shoreline. In 1946 the shire's headquarters moved to Biloela, the largest town. Moura, with 1800 people, is the next largest town. A short way south of Biloela is Thangool, which has the geologically rare Mount Scoria. It contains numerous finger-like basalt columns which emit a musical sound when struck. Mount Scoria is on the Register of the National Estate (1991). The leading employment sectors in the shire (2001) were agriculture (21%), retail and wholesale (17%), mining (10%) and education (6%). Ten years later, at the 2011 census, the leading employment sectors were coal mining (15.2%), sheep, beef cattle and grain farming (15%) and education (5.6%). Tropical cyclone Marcia crossed the coast at Shoalwater Bay in February 2015 as a Category 5 cyclone, having escalated from Category 1 in just a few hours. As it progressed southwards it was downgraded but caused widespread damage and subsequent flooding in Yeppoon, Rockhampton, Biloela, Gladstone, Monto and Gympie, and the smaller towns of Byfield and Marmor. The destructive winds and rain cut power, water, phones and damaged residences and businesses and agricultural crops. Several cottages on Great Keppel Island fell into the sea. Over 385 houses were rendered uninhabitable and another 1500 were damaged. The Bruce Highway was temporarily cut and many small towns were isolated. Exceptionally high rainfall triggered an automatic release of water from the Callide Dam caused widespread flooding in Jambin.